Carbon is the backbone of life. It is present in the atmosphere, oceans, soils and earth’s crust and basically divided into five pools. 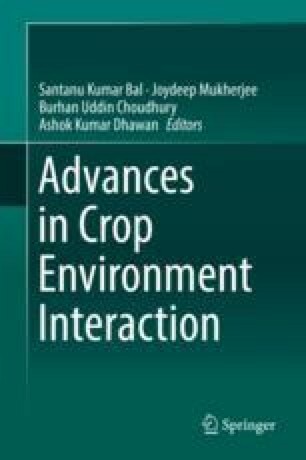 In this chapter, we have tried to find a link of carbon dynamics in soil-plant-environment system and climate change by keeping in mind the major food crop of India, rice. Climate changes have direct as well as indirect influence on dynamics of soil organic carbon (SOC) and its degradation kinetics that contribute to global warming. In future climatic scenario, there is an opportunity to increase carbon assimilation and carbohydrate accumulation in rice under elevated carbon dioxide (CO2) environment. Again, temperature moderates the carbohydrate allocation in plant and significantly affects the growth of crop. Moreover, under changing climatic scenario, methane emission may become an important driver because of higher belowground carbon allocation. Therefore, enhancing carbon sequestration, growing of rice with low carbon footprint and soil management for controlling different pools of SOC could be some of the emerging approaches which are discussed thoroughly in this chapter. We acknowledge the Director, NRRI & CRIJAF, ICAR-National Fellow Project (Agri. Edn. /27/08/NF/2017-HRD) and NICRA for providing support.